Another way of salting eggs is by storing them in clay instead of in brine. 1. Mix together 12 cups clay and 4 cups salt. Add water little by little as it is being mixed until an even distribution is attained. 2. Put a thick layer of this mixture at the bottom of the pot. 3. Wrap each egg in clay. 4. Arrange the eggs in the pot, about 2½ cm. apart to keep from breaking. 5. Cover again with salted clay and set aside for 2 weeks. 6. After about 2 weeks, try an egg. Cook at a heat that does not reach boiling point. If it is not yet salty enough, let the rest stay longer in the pot. 7. When the right saltiness has been reached, cook the eggs in water that does not boil up to 100°C for 15 minutes. 8. Brush with red color if desired. 1. The yolk can be discerned if the egg is put against the light. 2. The egg lies flat on its side when put in water. 3. The yolk is firm and the white is jelly-like, not spreading when the egg is broken. 1. In storing, the pointed end should be down and the rounded end up. 2. Do not wash soiled eggs, just wipe them with a clean cloth. So, buy only eggs with clean shell. 3. Keep in a refrigerator or in a cool place. 4. Keep in a well-ventilated place. Eggs absorb the odor of the room or its surrounding when this is in a closed place. 1. To thicken soup or sauces. 2 As binder, as in making embutido, torta or relleno. 3. To lighten cakes and muffins. 4. Improve the color of the baked food like bread. 5. Used in making mayonnaise and for salads. 6. As decorations for viands. 1. Makes the muscles firm and the skin healthy. 2. Adds red color to the blood. 3. Gives clarity to the eyes. 4. Hastens the growth of growing kids. 5. Gives stamina for work or play. Children, pregnant women or nursing mothers as well as the aged need at least an egg a day to meet the needs of the body. Those aged 20-59 needs only about half of this requirement. 1. The color of the shell has nothing to do with the nutrients they provide. 2. 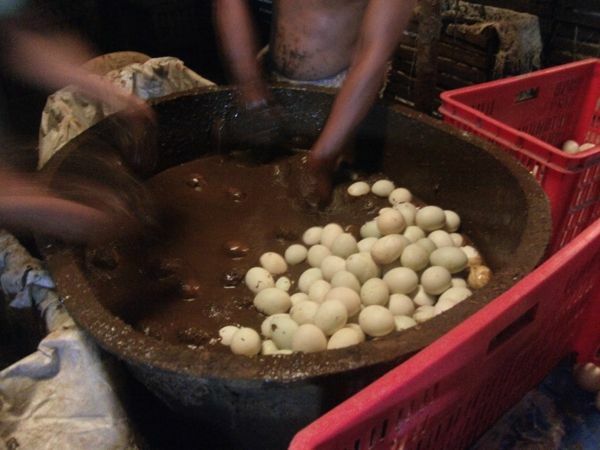 Balut contains more calcium and Vitamin A than ordinary eggs. 3. Eggs give much cholesterol, but should not be skipped in the diet, at least every other day. 4. In cooking, put over low fire or moderate heat, as overcooking causes hardening. 5. To remove the shell easily after cooking, put the boiled egg immediately in tap water after removing from the fire. It is also in this way that the black rim around the yolk is avoided.